Trilok Singh, Wish you happy Saraswati Puja! May Goddess Saraswati bless you with knowledge and more wisdom in 2018! I/we pray for a safer prosperous India on this auspicious occasion. Saraswati Puja is a Hindu festival and dedicated to the goddess of music, art and knowledge called as Saraswati. This festival is celebrated in January or February across the India. Further, The name Saraswati came from “saras” (meaning “flow“) and “wati” (meaning “she who has “), i.e. “she who has flow”. So, Saraswati is symbol of knowledge; its flow (or growth) is like a river and knowledge is supremely alluring, like a beautiful woman. In Hinduism Saraswathi is the goddess of knowledge, music, arts and science. She is the consort of Brahma, also revered as His Shakti. Greetings on Basant Panchami. I pray that this auspicious occasion makes our society happier and even more harmonious. May the blessings of Maa Saraswati always remain with us and bestow us with wisdom. During the occasion Brahmins are fed, god of love Kamadeva is worshipped, special prayers for goddess Saraswati are organized by many educational institutions, Pitr Tarpan or ancestor worship is performed and children are taught to write their first words. On this day, yellow color is considered very important and therefore people dress up themselves in yellow color clothes, consume yellow sweets, and worship Saraswati in yellow clothes. The goddess is offered yellow flowers, gulal, fruits, yellow colored sweets, roli and moli. Moreover, Vasant Panchami day is dedicated to Saraswati, the Goddess of knowledge, music, arts, science and technology. Goddess Saraswati is worshipped on Vasant Panchami day. Vasant Panchami is also known as Shri Panchami and Saraswati Panchami. In Bihar’s Aurangabad district, the Deo-Sun shrine was established on Basant Panchami by the King Aila of Allahabad. This event is celebrated on this day as the birthday of the Sun-Deo God. 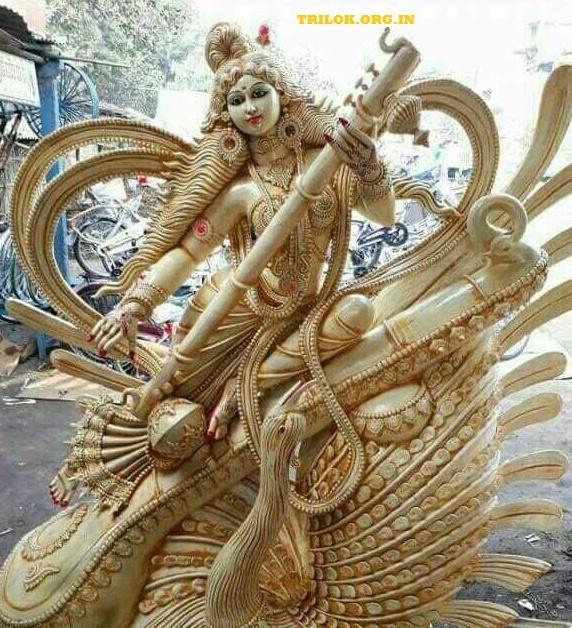 The statues are washed and their old clothes are replaced with new ones on Basant Panchami. In ancient times, the festival was celebrated in the royal palace of Kamadeva. In Maharashtra, Madhya Pradesh, Chhattisgarh and Uttar Pradesh, people worship Shiva and Parvati and offer mango flowers and wheat. In West Bengal, people worship goddess Saraswati, the goddess of knowledge, education, music and art. The festival signifies that knowledge is supreme, and prevails over ignorance. Girls and women drape themselves in yellow traditional attires while men and boys wear clothes mostly in yellow. In West Bengal, people worship goddess Saraswati, the goddess of knowledge, education, music and art. The festival signifies that knowledge is supreme, and prevails over ignorance. Girls and women drape themselves in yellow traditional attires while men and boys wear clothes mostly in yellow. In Short, The day celebrated as a religious festival across the India. In the Rigveda, Saraswati is a river as well as its personification as a goddess. In the post-Vedic age, she began to lose her status as a river goddess and became increasingly associated with literature, arts, music, etc. In Hinduism, Saraswati represents intelligence, consciousness, cosmic knowledge, creativity, education, enlightenment, music, the arts, eloquence and power. Hindus worship her not only for “academic knowledge”, but for “divine knowledge” essential to achieve moksha..
She is mainly associated with the color white, which signifies the purity of true knowledge. Occasionally, however, she is also associated with the colour yellow, the colour of the flowers of the mustard plant that bloom at the time of her festival in the spring. Saraswati is the mother of Sanskrit the language of the Gods and is the consort of Brahma. Thanks. ऑथर, त्रिलोक सिंह! (संस्थापक, यूथ दर्पण और आईएसमाइंड.कॉम).